I’m a big fan of classic movies. I’ve seen every Oscar winner and every movie on the American Film Institute Top 400, British Film Institute Top 100, and the Internet Movie Database Top 250. (OK, I may have skipped Princess Mononoke.) Whenever a new list comes out, I’ve got homework. Exciting movie: Brazil (1985), dir. : Terry Gilliam. Brazil may or may not be set in South America; we never see enough of the scenery to know. The setting is a not-too-distant-future dystopia in which society is on the brink of collapse under the weight of its own bureaucracy. The real plot of Brazil is a story of unrequited love. Sam Lowry (Jonathan Pryce), an everyman, has fallen for his dream girl, a suspected terrorist named Jill (Kim Greist). Driven by his passion, Sam throws himself into a reckless pursuit of Jill, believing he is saving her from the long arm of the authoritarian law, even as his actions seem to make matters worse for both of them. The story is propelled forward by nearly nonstop action: bombs, car chases, crashes, and one massive poop explosion. This one definitely goes in the “exciting” category and is one of my all-time favorite movies. Boring movie: Remains of the Day (1993) dir. : James Ivory. Remains of the Day is also a story of unrequited love. Stephens (Anthony Hopkins) is the well-mannered butler to Darlington Hall in England. A new housekeeper arrives, Miss Kenton (Emma Thompson), who is equally professional but not as emotionally detached. An attraction develops between the two, a fact Miss Kenton is willing to express, but driven by duty, Stephens is not. There are no car crashes or poop explosions, no death-defying escapes. And yet Remains of the Day takes the viewer on an extraordinary emotional journey. The script, based on Kazuo Ishiguro’s 1989 novel, is flawless, and the acting is stellar. 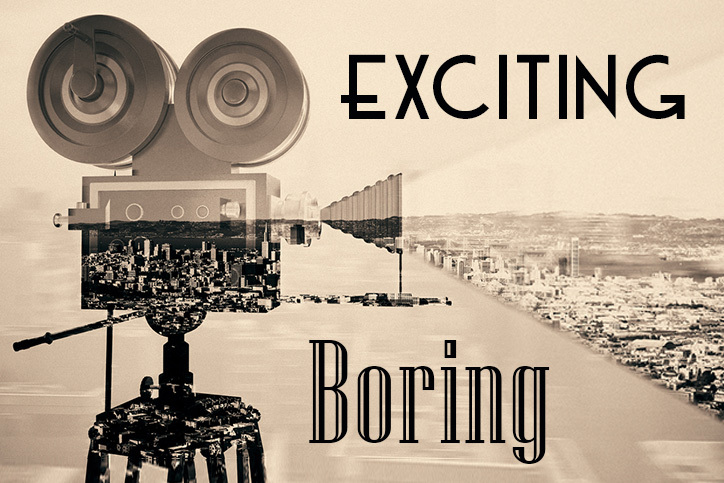 Yes, I called it boring, but it also earns a spot on my all-time favorites list. Investment plans also fall into two categories: exciting and boring. Exciting planning: Active management is exciting. Analysts pore through news and stock data and make bets on stocks they think will make big money for their clients and themselves. It’s like a day at the racetrack, betting on the ponies. If you listen hard in the trading room, you’ll hear the roar of the crowd, the clanging of bells, the thrill of the frantic home stretch push as that horse you bet on either surges ahead … or falls short. Hedge funds are active management on steroids, usually investing in (and sometimes against) just a handful of companies, so that the fortunes or misfortunes of anyone’s bet can have a profound impact on one’s wealth. Boring planning: Boring planning doesn’t have a team of researchers trying to get the slot machine to pay off. With boring planning, the hard work has already been done long before you make your investment. Academicians have done research, applied statistic models, proposed theories on how markets work, and then come up with ways to apply that knowledge to create investments to capture returns for investors. Come to think, there are no boring movies about investing. The Big Short, American Psycho, Boiler Room, Barbarians at the Gate, Wall Street—they’re all about the exciting world of active investing (and one about chainsaw killing). How has Hollywood missed the box office potential for a movie about passive, academic-based, institutional mutual fund investing? Whether Hollywood makes a movie about it or not, we’re sticking with boring planning. Long-term financial goals aren’t well served by a strategy of trying to figure out who’s going to win the fifth race this afternoon at Pimlico. Go ahead and make a $2 bet if you like, and throw a couple of bucks at the Powerball. It’s exciting and fun. But keep your nest egg in a boring place.